WHO recommends vitamin A supplements to improve child survival. Vitamin A supplements have been shown to reduce the number of deaths from measles by 50 per cent, in populations with vitamin A deficiency. For children who are vitamin A deficient or undernourished, it would seem a simple solution -- immunization against measles and better nutrition -- to save lives. 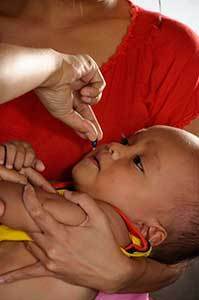 In addition to vaccines, this baby receives life-saving vitamin A supplement to boost immunity. Measles has been making headlines recently in North America, adding a new worry for people with young infants not quite old enough for vaccines or whose children suffer from compromised immune systems. However, measles is not new. It is a highly contagious, serious disease caused by a virus that, before widespread vaccination, caused 2.6 million deaths each year. Despite the success of a measles vaccine, which saw a global drop of 75 per cent in measles deaths between 2000 and 2013, measles still remains a major cause of death among young children around the world. According to the World Health Organization, in 2013 more than 145,000 people died from measles -- 400 deaths a day -- with most being children under the age of five. 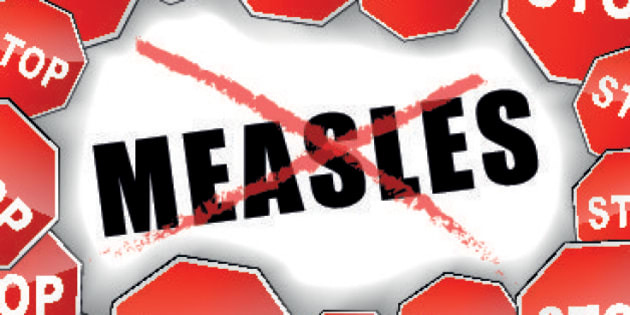 There is no antiviral treatment available for measles. The benefits of a measles vaccine as an effective public health intervention cannot be disputed. The World Health Organization (WHO) states that routine measles vaccinations for children, combined with mass immunizations in countries with high measles case and death rates, are key public health activities to reduce measles deaths. However, many of the world's most vulnerable children suffer from poor nutrition, including being vitamin A deficient, which increases their risk of death from measles, and can decrease the effectiveness of the vaccine. They live far from health centers and health infrastructures. They are at risk of missing, or being missed by immunization and vitamin A supplementation campaigns. The Micronutrient Initiative collaborates with partners who deliver vaccines to ensure vitamin A supplements are integrated into immunization campaigns, especially for specific hard-to-reach populations. Dedicated teams make arduous journeys, in some cases in dugout canoes across rivers and flooded roads, to reach isolated villages to hand-deliver vaccines and vitamin A supplements. It may makes sense that when a body is properly nourished, it can fight off sickness easier, but a well-nourished body is not a healthy justification to avoid vaccines. While having vitamin A delivered after a 24-hour journey in a boat may seem a world away for people living in North America, infectious diseases travel much more quickly due to globalization and can easily impact anyone unvaccinated and exposed. With recent cases of measles being traced to Disney World, we are once again realizing that "it's a small world after all."